Ext2Fsd is an ext2 file system driver for Windows 2000, XP, Vista. It’s a free software and everyone can distribute and modify it under GPL2. 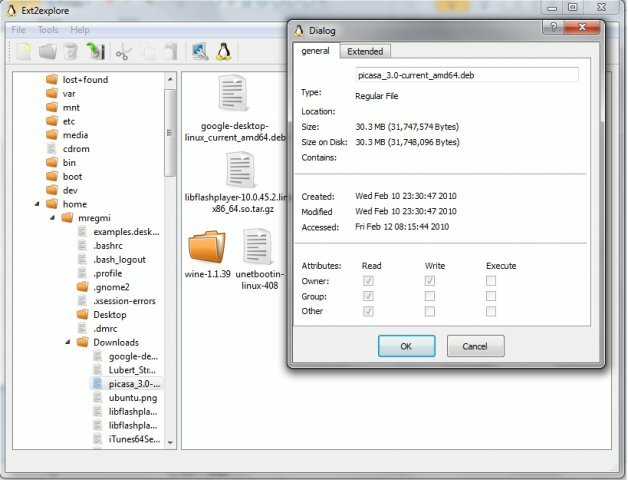 Important Note:- When creating/formatting the ext4 filesystem, make sure to add “-O ^extent” which means disabling the “extent” feature bit. The following steps will not work if your ext4 filesystem still has “extent” feature enabled. ext2 and ext3 partitions should be fine. Right-click the downloaded file and click Properties. Set the compatibility mode to “Windows Vista Service Pack 2? and check “Run as administrator”. Run the ext2fsd installer. During install, we recommend you uncheck the “enable write access” feature to safeguard against losing data in your Linux partitions. Restart your Windows 7 PC and run the Ext2 Volume Manager from Start Menu. If you have any other tools to do this you share with us. ext2fsd is basically for ext2/ext3. The ‘extent’ feature is enabled for ext4 in most cases. That’s why using ext2fsd is simply not suggested for ext4 partitions. Your file system can easily be screwed! Then I’d suggest that the developers of these applications ADD support for extents to them to better allow reading/writing ext4 filesystems WITH the extents turned on. Can anybody describe differences of Ext2IFS vs. Ext2Fsd. I use the former. Am I missing anything? For ext2/ext3 I recommend ext2fsd that create a permanent drive letter in Explorer (transparent integration). To use with Windows 7, a tip is to install with Windows Vista compatibility mode. i have problem when im launching ext2read in win 7 im launching like administrator but it still saying dat i dont have permmision to launch it. what went wrong any idea? Ext2Read works, yes, but damn… it has the worst interface ever! Hmmm… I avoided it altogether. Had WD 1.5TB HDD with 750GB NTFS and 750GB EXT3 partition on it. Asked Ubuntu to copy about 10GB of files from EXT3 partition to NTFS and result is partition vanishes mid-copy leaving drive undetectable by anything, including WD’s own diagnostic tools. Tried Seagate which can make the drive attempt reads, but it errors on every read all they way through the drive. Windows cannot write to it, repartition it or anything. It says it is 0GB in size. Linux say it is FFFFFFFFFFFFFFFF GB in size. Worst and strangest drive failure I have ever seen. @Hmmmm, if I understood you correctly, you’re saying that ubuntu messed up your disk while copying data between two of its partitions. This has nothing to do with the tools that this blog article describes. I can not get write access to my ext4 partions even if I turn it on. I get permission denied errors. Does anyone know what I am doing wrong? I partitioned my approximate 1TB Hdd with GParted. I created a 98 GB NTFS partition, a 276Gb NTFS partition and the remainder(approx 556 Gb) is an Extended Partition. 2 Logical partitions are within the extended partition of 60 Gb and 62 Gb and 433.82 Gb unallocated space. Win 7 Microsoft management console does NOT show an Extended Partition. The WIN7 MMC shows 4 PRIMARY partitions with the last 2 partitions of 60 Gb and 62 Gb and 433.82 Gb unallocated space. Why cant I see Extended partitions & why are logical partitions shown as 2 Primary in Windows 7. Only if you are. 🙂 IFS is older and last I checked didn’t support new stuff with ext4 as you’d want it to; it also isn’t, IIRC, open source. Fsd is newer, open source, and as a result does support ext4 now, and should continue to improve over time.